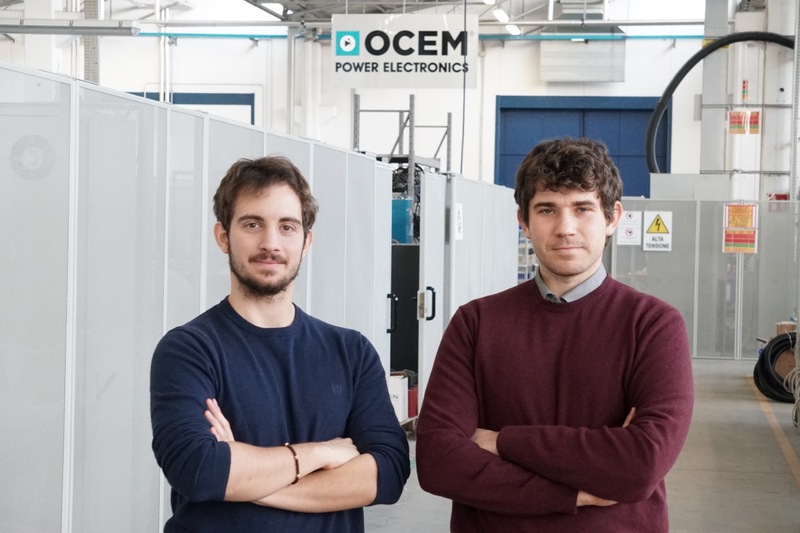 Left to right: Mattia Mantellini and Filippo Gherdovich said they were glad they chose to do their doctoral research at OCEM. When Filippo Gherdovich, 33, decided to pursue an industrial engineering PhD, he faced an important choice: should he conduct his research in an academic setting, such as a laboratory, or should he join one of the program’s industry partners and conduct R&D in a company? Gherdovich opted for the latter, joining OCEM as a doctoral student researcher. For his dissertation research he helped develop a cutting-edge power electronics solution for ENEA, the Italian National Agency for New Technologies, Energy and Sustainable Economic Development. OCEM is one of just a handful of companies offering doctoral students the chance to conduct their dissertation research in-house and develop solutions for real-world market needs. The company is currently recruiting students interested in fusion energy, particle acceleration and other power electronics applications. Gherdovich joined OCEM through the company’s partnership with an innovative Masters program at Tor Vergata University in Rome. The Master in Fusion Energy aims to prepare highly skilled graduated students to work in fusion energy by connecting research and academic study with the practical challenges of manufacturing a fusion power plant. Students can then count the Masters toward the first year of a PhD in fusion energy, which Gherdovich decided to pursue. He successfully defended his dissertation in December and stayed on with OCEM as a Development Engineer. While Gherdovich was putting the finishes touches on his dissertation, another doctoral candidate, Mattia Mantellini, 25 from Forlì, joined OCEM at the end of October. Mantellini is working on a power electronics system to control electrical energy generated by ocean waves. Mantellini said he jumped at the opportunity to conduct R&D in an industrial environment because it meant he could be in contact with clients and suppliers. He also appreciates the company’s hands-on approach to learning. Both Gherdovich and Mantellini have also embraced OCEM’s approach to wellness and employee satisfaction. The company offers free fitness classes, ski days and theater tickets, among others. They also enjoy being part of a company that values young people and encourages them to collaborate. To learn more about the dissertation research positions available at OCEM, contact us here.